- Excellent tool to punch Accurate Hole in gasket Material, light gauge sheet metal, Vinyl, Plastic, Leather, and more. - Made from hardened & tempered high Carbon Steel. 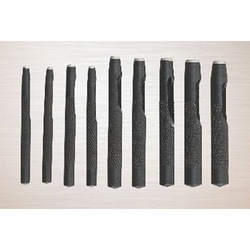 - Precision Ground edges facilitates easy cutting. - Inside taper for clearance. - Sets are in an attractive Plastic Pouch. - Also available in individual sizes. Size (Inch): 3/32" to 1"
Manufactured from hardened carbon steel. Through body ejection of the punched material makes them ideal for punching clean edged holes in leather, wood, plastics, card and paper. The disc of material cut by the punch is ejected through the hollow body of the punch to leave a clean edged hole, every time. 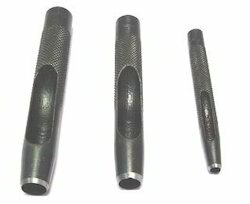 As an acclaimed entity, we are offering a premium quality collection of Hollow Punch to our valued clients. We are engaged in manufacturing and supplying an extensive array of Hollow Punches and precision engineered products enabling clients to design their required dies.